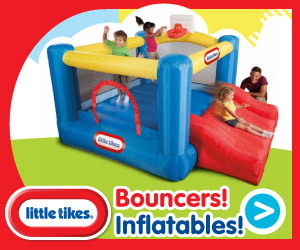 Bouncers are a great addition to any play date. This year, try something new and jump start social play for growing toddlers by introducing active play unlike anything thing they have experienced before. Not quite sure how to do it? Check out Darcy’s take on the Junior Sports ‘n Slide Bouncer at her blog, Tales from the Nursery, for some tips on hosting these magnificent play dates. Just in time for the new school year! PreviousCheck out what our friends at “To Be Thode” have to say about our Little Tikes 2 in 1 Art Desk and Easel. The 4 in 1 baby born nursery is adorable! I would love to have this for my daughter!